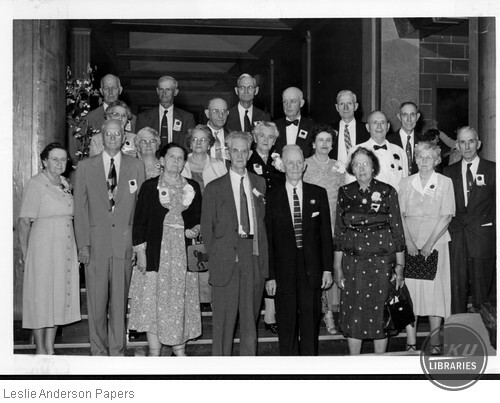 Pictured are First Row l-r: Jennie Jeffers Ashby, S.B. Chandler, Flora Sullivan, W.J. Grinstead, E.C. McDougle, Elizabeth Scoville, Mabel Mason, C.S. Dale; Second Row l-r: Alma Rice Bascom, Ila Pettus, Mrs. S.B. Chandler, Mrs. Burdeaux Ferguson Cotton, Mr. and Mrs. H.L. Davis; Third Row l-r: Mr. G.D. Hamilton, Mr. Cam S. Holbrook, Mr. Dudley Starns, Mr. Leslie Anderson, Mr. C.H. Gifford, Mr. O.L. Mullikin, Mr. J.B. Campbell. unknown, “Eastern Pioneer Reunion Group,” Digital Collections, accessed April 25, 2019, https://digitalcollections.eku.edu/items/show/1908.